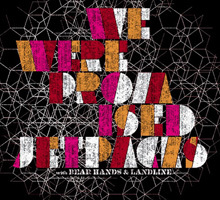 We We Promised Jetpacks, with Bear Hands & Landline silkscreen, limited edition poster. 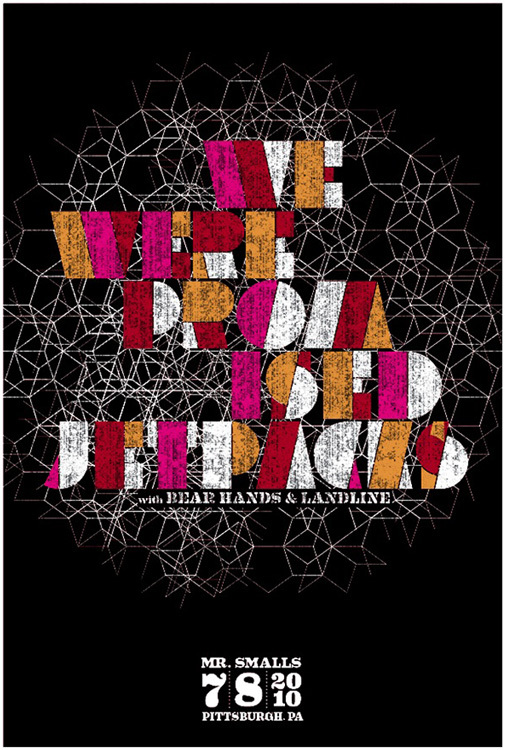 Hand screen printed poster for We Were Promised Jetpacks on July 8, 2010 at Mr Smalls, Pittsburgh, PA.
ROMG! Do you love this band like we do? ‘Cause we sure do. If it’s not Scottish, it’s crap. And that’s pretty true as pertains to music. 4 color (3 screens)with dark yellow, magenta & space black non toxic screenprinting inks and in produced in a limited edition, this poster is signed (by me, strawberryluna) and numbered. Overprint magical secret = Where you see red, the yellow inks were overprinted by transparent magenta to make a hot red. Edition: 105. Size: 16 x22 inches (39.4 cm x 55.9 cm.) Paper: archival Cougar, White 100lb cover weight.